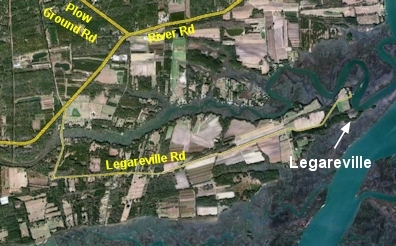 Legareville, at the confluence of the Stono and Kiawah Rivers, was the summer resort for Johns Island’s plantation owners before the Civil War. The village had two dozen dwellings and both Episcopal and Presbyterian houses of worship. At the beginning of the Civil War, in November 1861, the village was evacuated and abandoned along with the rest Johns Island by the order of General Robert E. Lee, commander of the Department of South Carolina at the time. The Union Navy stationed gunboats on the Stono River off Legareville enforcing the blockade through most of the war. On Christmas Day, 1863 the Confederates moved batteries into Legareville and shelled the USS Marblehead driving it off. Subsequently Union troops landed at various times and began dismantling the houses at Legareville to use the lumber in their encampment on Folly Beach. In August 1864 Major John Jenkins, in command of the Confederate forces on Johns Island, decided to burn the village to prevent the Union forces from further plunder. His report stated, â€œWhen the determination to destroy the village was announced the Stono Scouts, owners of the property on the place, volunteered to aidâ€. Thus Johns Islanders destroyed their own summer retreat to prevent it from being of further use to the enemy. “I have a painting of Legareville which I copied from a painting made in 1870 by Portia Trenholm from a pencil sketch done in 1852, and which is now owned by Mrs. Bell Burden Walpole, of John’s Island, who inherited it from her father. The old foundations, chimneys, wells and cisterns which survived the destruction of the village, were utilized as local sources of supply for brick, and only a few large cedars and oaks remain to mark the site, now owned by members of the Hay family. Originally the land was owned by the Legare family, who sold lots to other planters. very interesting, I had heard for years about this place and the fact that my great great grandmother Ethel Burton Trenholm was known for her landscapes, this is the first I have seen one.I would appreciate any info you have on Legareville .